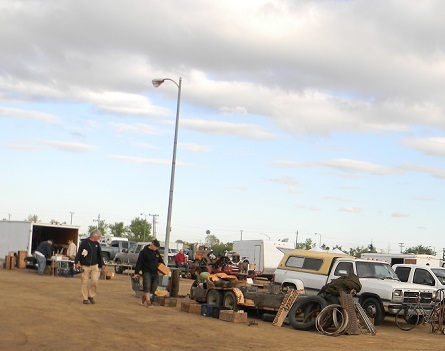 Bakersfield swap meet can be dusty or muddy depending on the weather. This year it was neither, the weather was perfect! 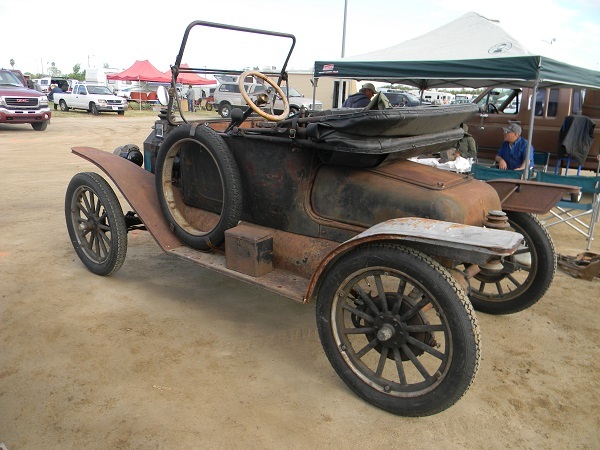 Bakersfield Pre – War Swap Meet is a joint venture of the Horseless Carriage Club of America and the Kern County Model T Ford Club. 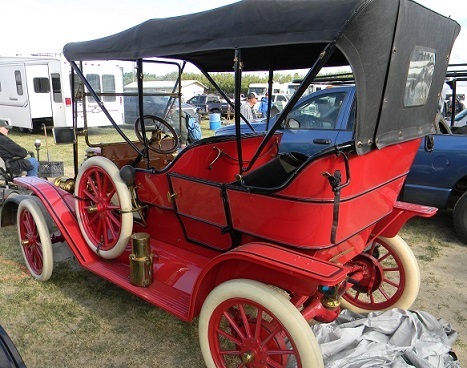 The majority of the parts offered for sale by vendors are Model T Ford, but that is understandable considering that the Model T Ford was the most prolific car in the era prior to WWII. Without a doubt Studebaker was the second best represented make at this meet. 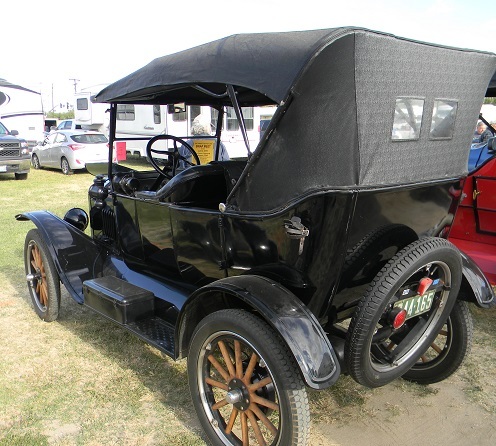 A good looking black era Model T van was near the entrance. 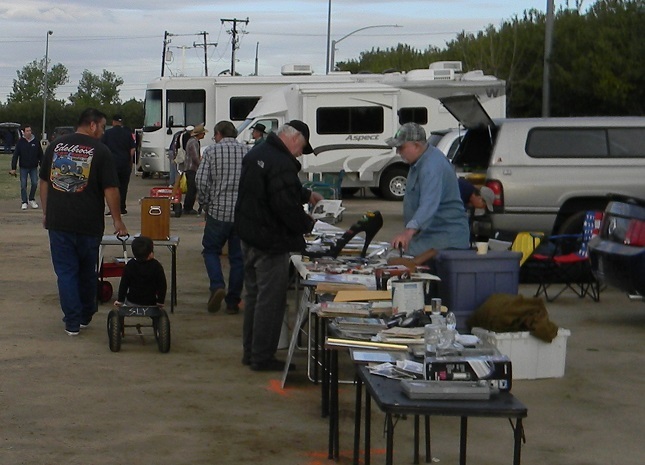 The meet was well attended by both vendors and buyers. 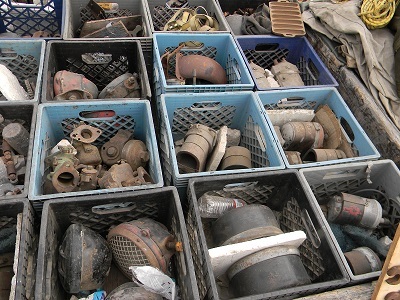 If you were willing to dig through piles of stuff there were bargains to be had. 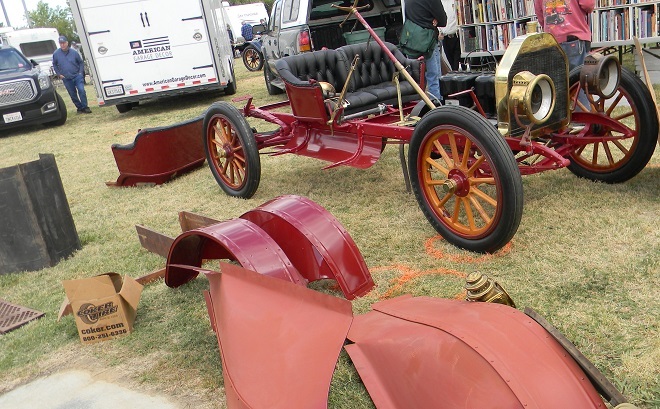 The metal objects on the ground are “buggy irons” for an early top, circa 1908. 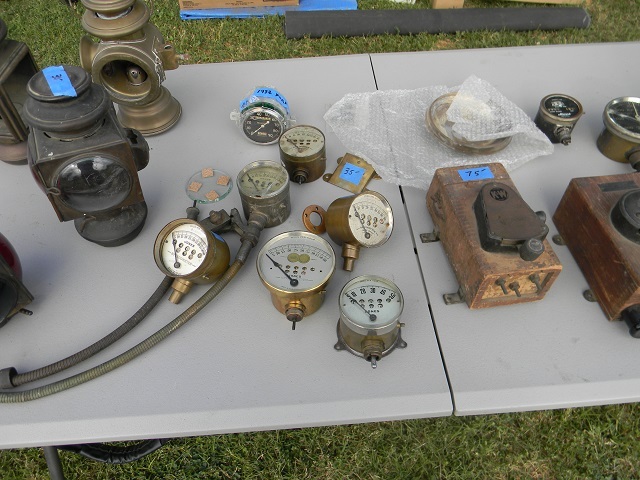 A nice selection of brass items were on sale by several vendors. 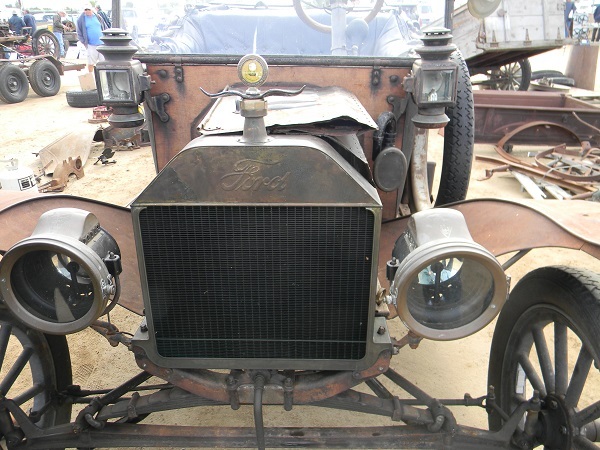 This one has reproduction carbide generators and some nice JNO Brown #19 headlights for 1911 – 1912 Ford. 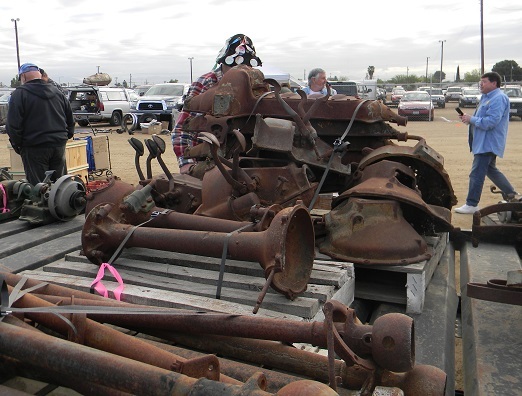 This fellow had a ginormous amount of Model T chassis parts for sale. 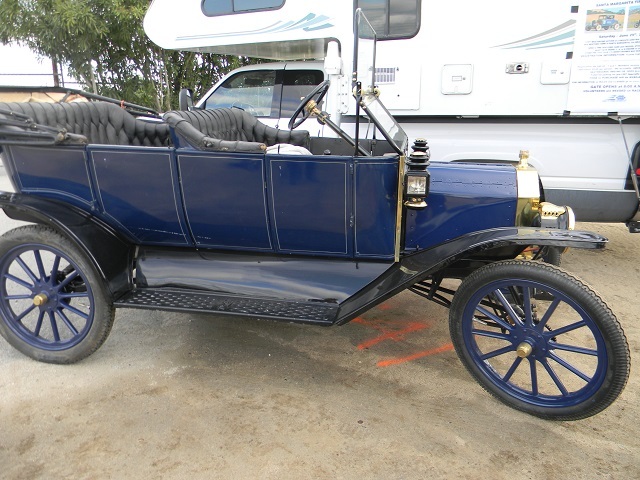 A nice 1913 Canadian Model T Ford touring was nearby. The blue paint was fresh. Cowl lamps are the later 1914 style with no jewels. 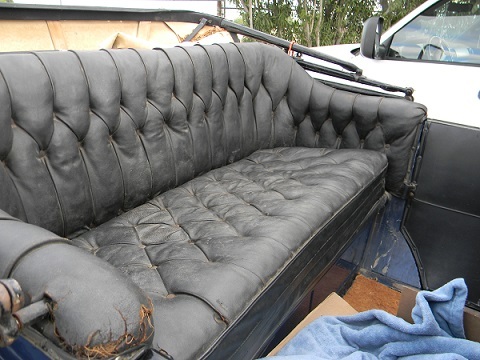 Upholstery was old leather, probably original. Interior of the ’13 Canadian touring. 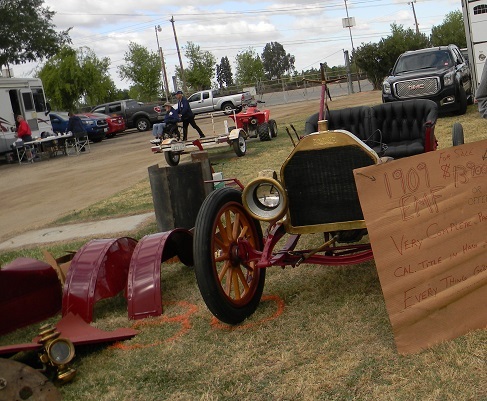 This vendor didn’t have many if any automotive items. Just a bunch of old stuff. Buyers were interested. 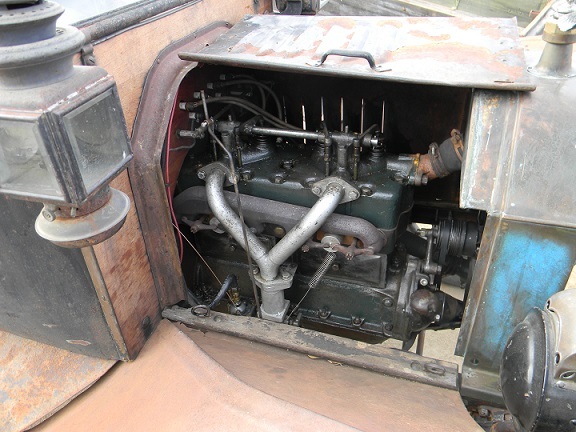 Unrestored 1914 runabout had a secret under the hood……..
A four valve Rajo offers sprightly performance! The car was being offered at $18,000 or best. 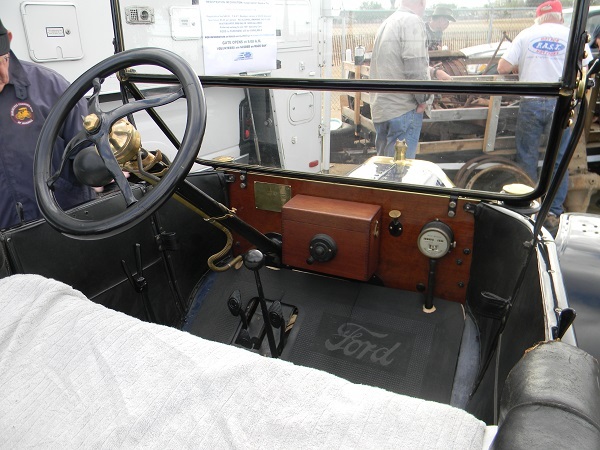 Interior of the ’14 was mostly removed to show the outstanding original wood in the body. A Ruckstell shifter is in the middle of the floor boards. Period accessory brakes were installed too, and very necessary given the 40 horsepower under the hood. 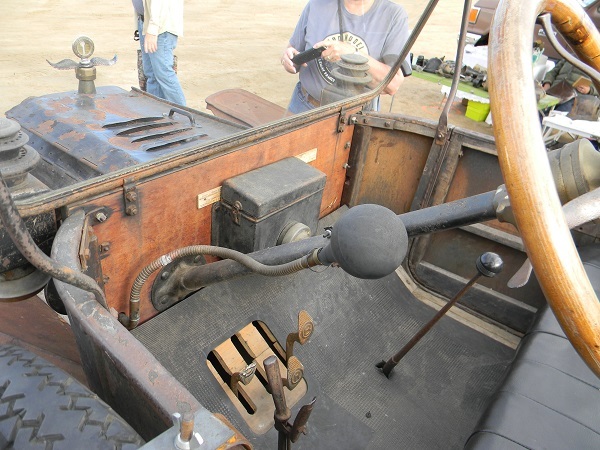 This is the view most drivers of other Model T’s would see on tour. 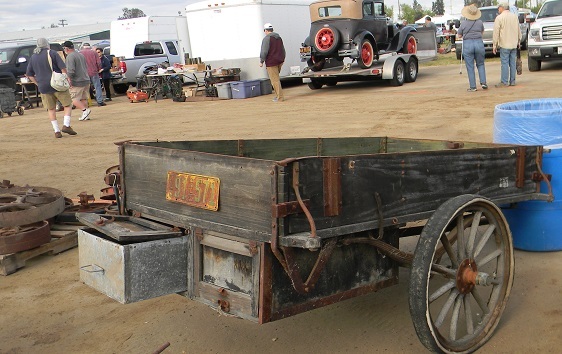 Not sure if this trailer was part of the deal but it looked the part. 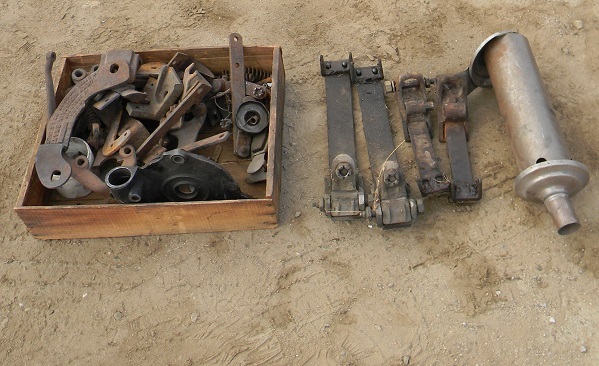 There was no shortage of Model T chassis parts. 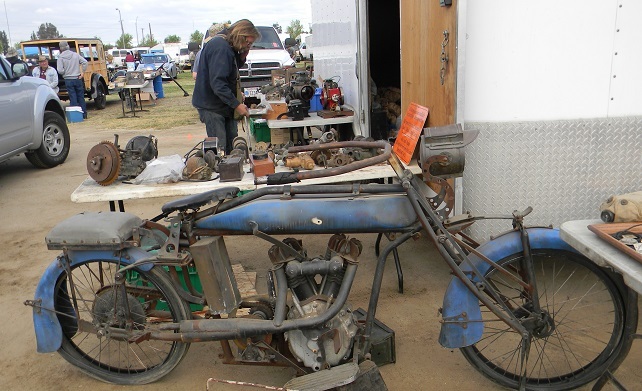 This probably looks like an antique motorcycle but in fact it is a movie prop powered by an electric motor. It was for sale. 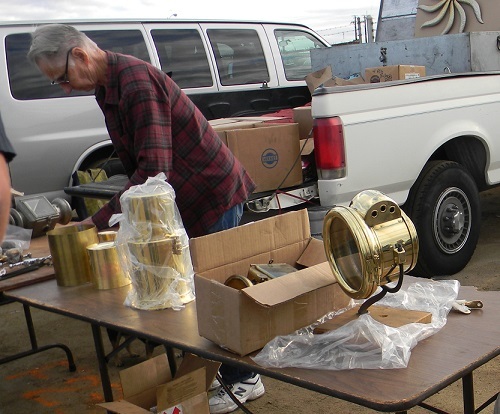 Same guy had a box of vintage 1960’s model airplane engines and propeller parts. 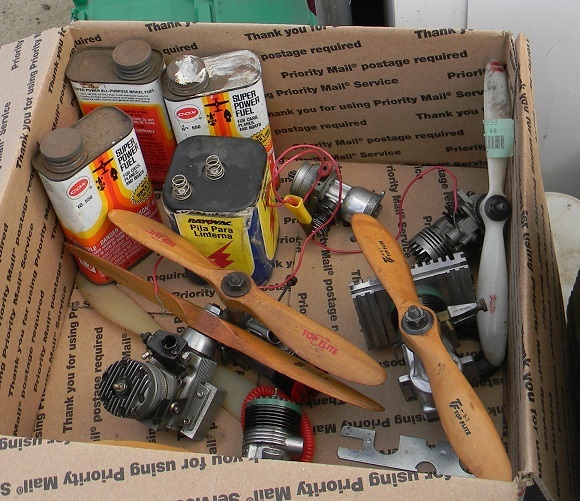 This is often what came home with me after a crash during my model airplane days of that era. Accessory overload springs for Model T were all over, as were various Model T shock absorber sets. 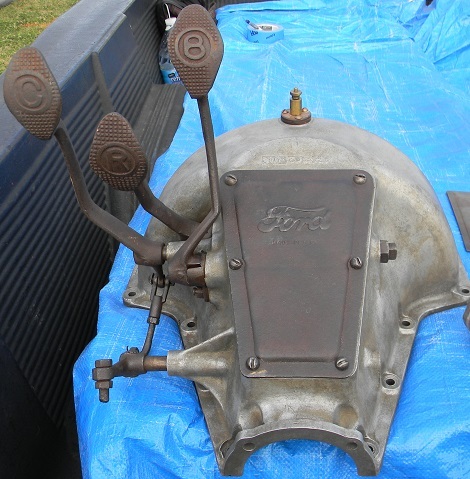 Terry H was selling a mostly complete T speedster. 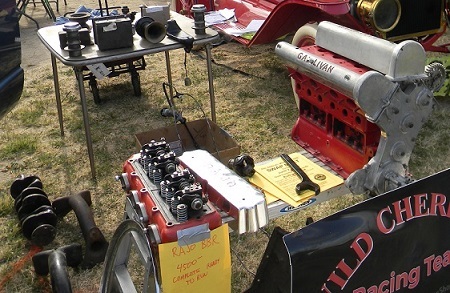 The next several photos are from the Studebaker club display. 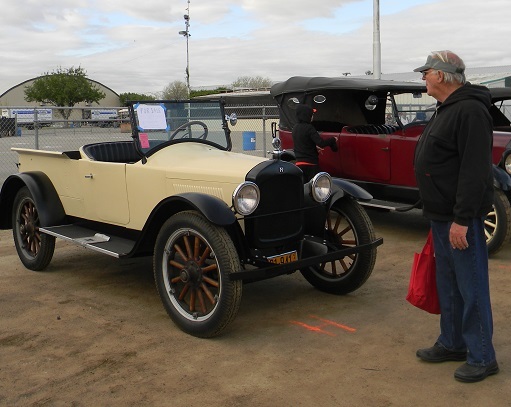 This little Studebaker pickup was for sale and appeared to be nearly tour ready. 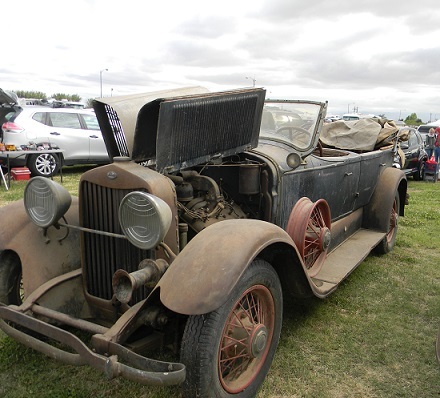 Yes, another Studebaker. This is an early one, I suspect 1914. 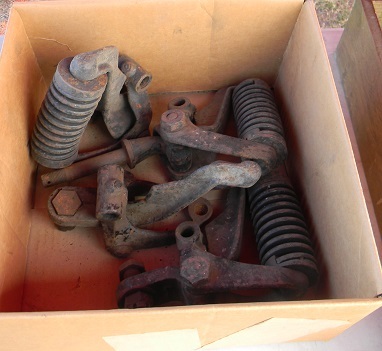 Another very reasonably priced set of Model T spring shocks. 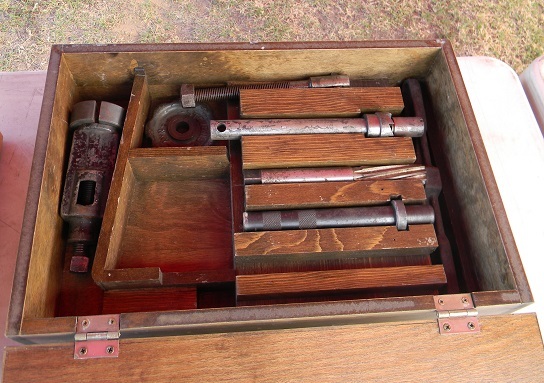 A Stevens drive shaft bushing tool kit for Model T Ford, in the original box! If you needed a Jones speedometer this guy had you covered. 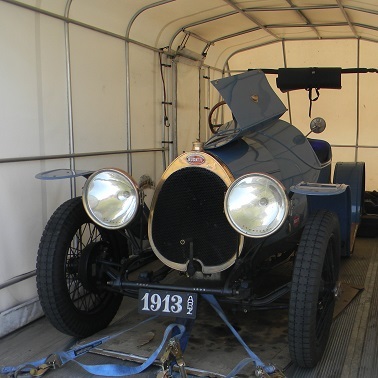 1913 Bugatti had completed the HCCA tour and was not for sale. 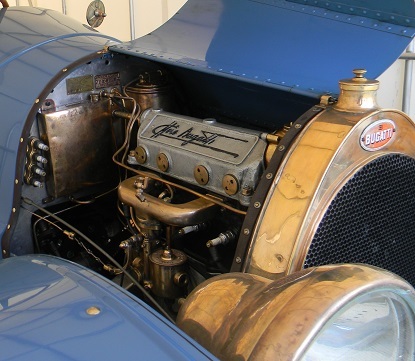 SOHC Bugatti four is one of the earliest Bugattis not owned by the Schlumpf museum in France. 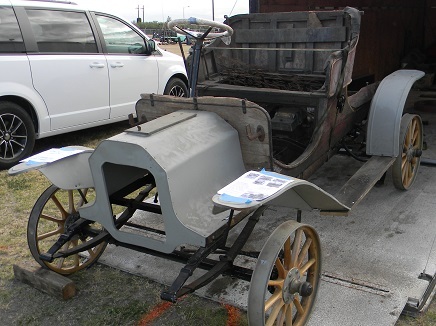 Single cylinder REO had re – wooded wheels and was mostly complete, ready for a restorer to finish. 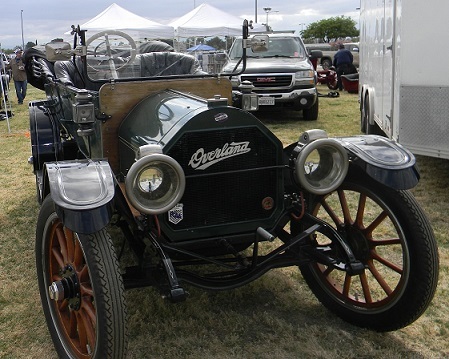 Best I could tell this was a 1917 – 1918 runabout. 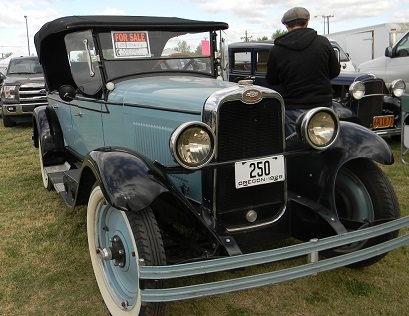 It had some 1926 – 27 Canadian Hayes wire wheels that are very desirable. Someone made it into a “1915” at some point. 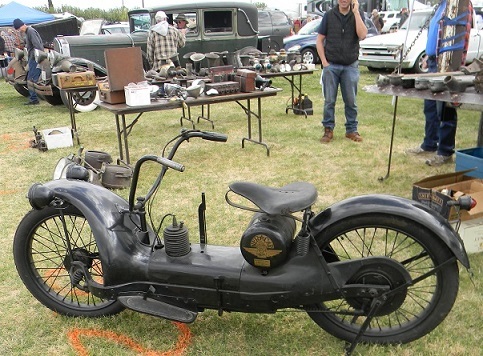 It would make a great 1917 for the right price. 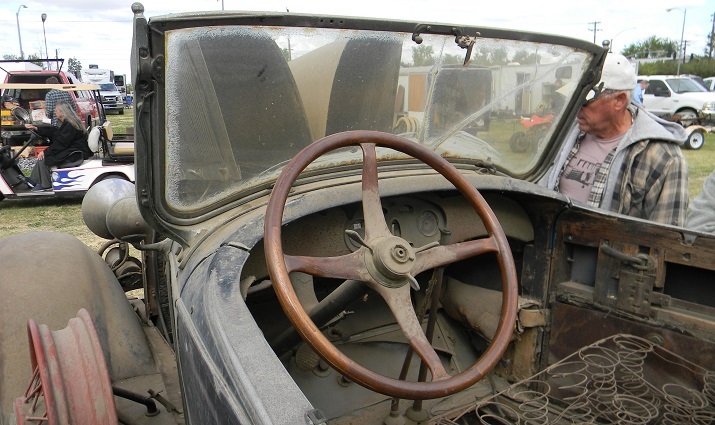 The 1917 – 1918 windshield and door latch give this away. Still, there was a deal to be had. I heard the asking price for this car was $80K. Really nice ’24 touring was nearby. I never heard if it was for sale or not. 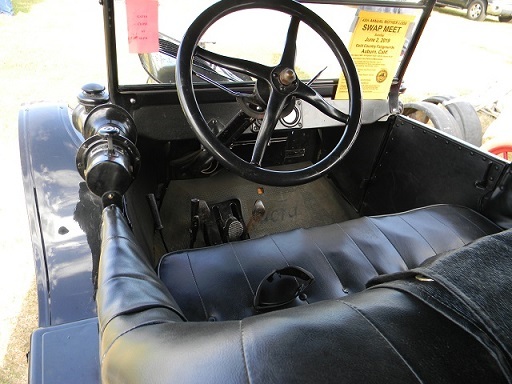 Interior of the ’24 was really nice. 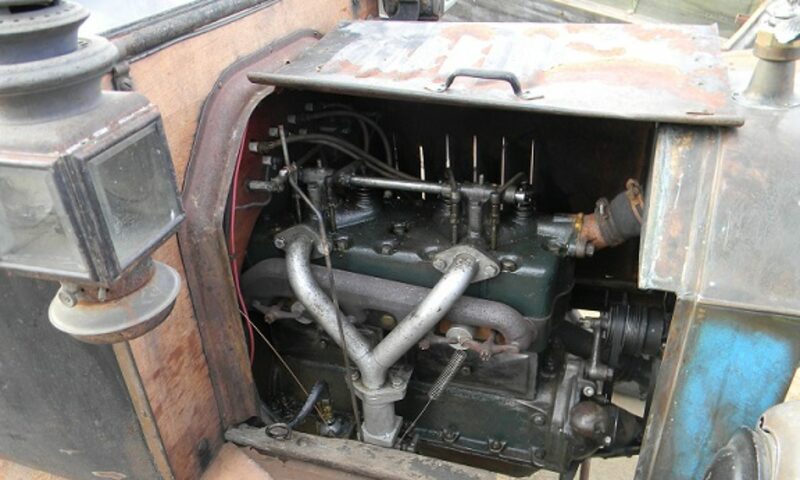 DOHC Gallivan engine is Model T based. These were made in the 1970’s – 1980’s during the heyday of the Long Beach hill climb. No telling how much power one of these could make. 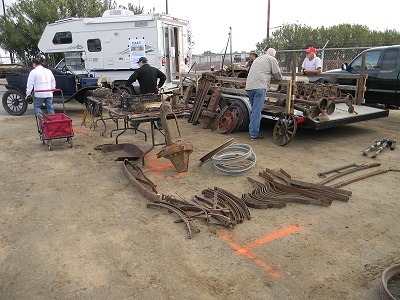 A counterbalanced “T” crankshaft is on the ground in this photo. The Gallivan has superior design and machine work. It is almost too pretty to operate. 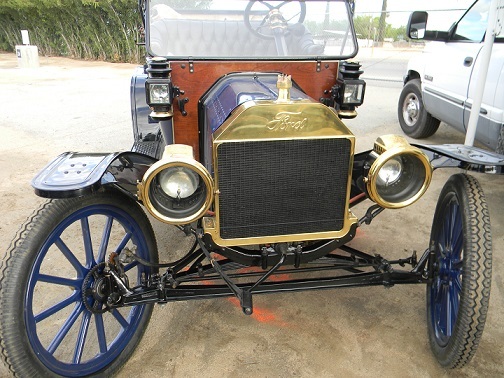 A late 1912 block was for sale showing the rare serial number / date combination above the water inlet. This block needed a lot of work but could make a nice addition to someone’s project. This hogshead was offered by the same guy. 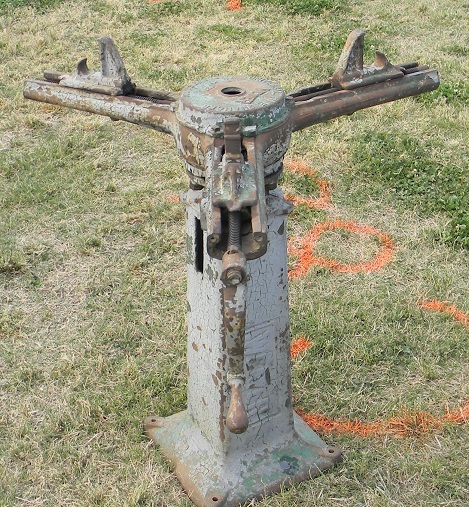 It is also a 1912 part, with the distinctive lack of reinforcement around the bolt holes. 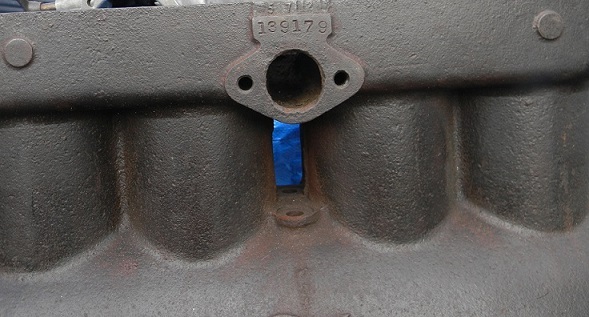 Hogsheads made in this era are easy to identify because the casting date is quite easy to identify. 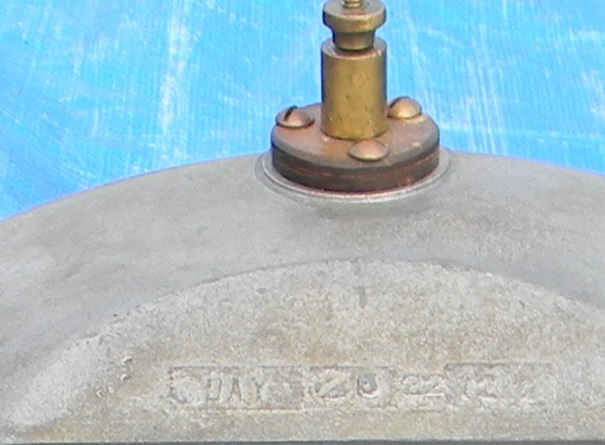 This one reads “DAY 5 22 12” which of course means this hogshead cover was cast on May 22, 1912. 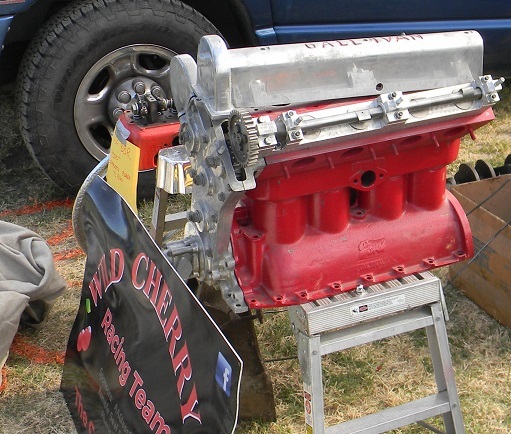 A perfect match for the engine block which was cast May 7, 1912. 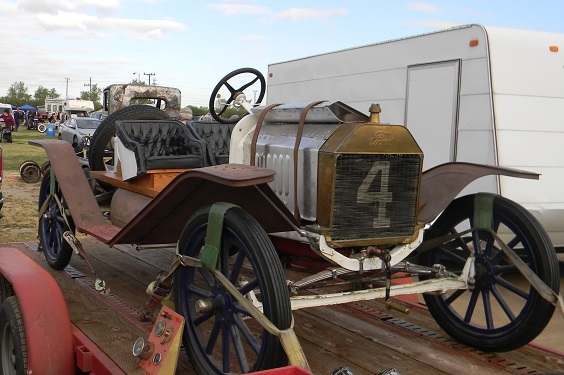 Both would be appropriate for a car built in early June of 1912. 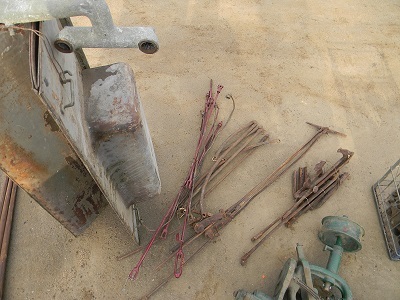 Weaver tire changing tool from the 1920’s was complete and operable. And heavy! 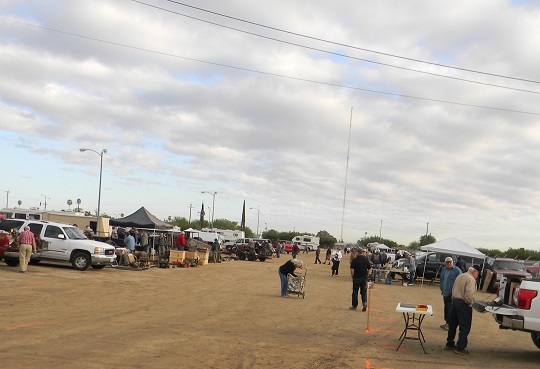 The swap meet consists of approximately 5 aisles like this, each about 1/8 mile long. 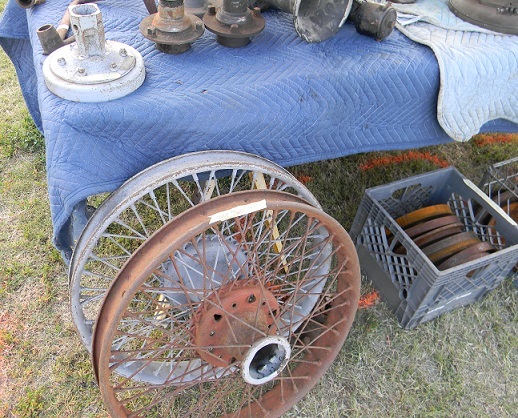 Several vendors were offering accessory Model T wire wheels and hubs. 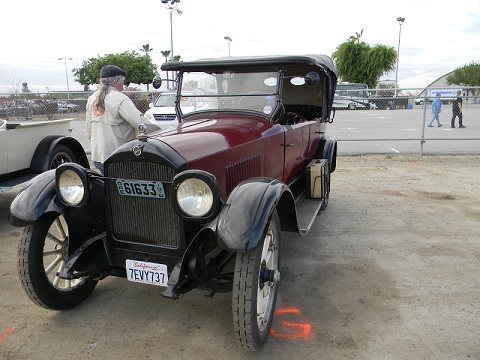 Lovely 1929 Chevrolet coupe needed nothing except a new owner. 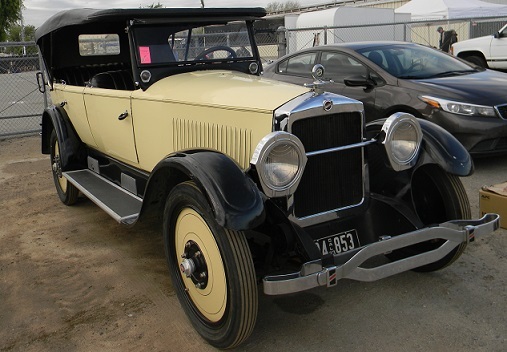 Rare Chevrolet touring in immaculate shape was being offered at a very attractive price. 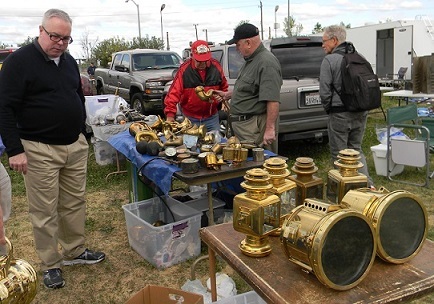 Probably the best deal offered at this swap meet was a very complete 1909 EMF project. The asking price was $13,900. The EMF 30 tourabout was very impressive. I overheard a fellow saying he was thinking of buying it to build a speedster which to me would have been a crime. If you had enough cash these could be yours. Not sure if this was actually authentic but it sure was neat. 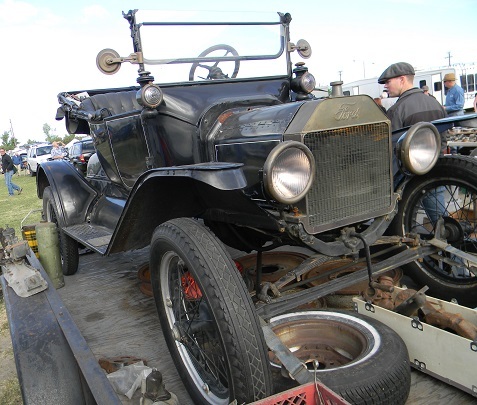 The 1931 Pierce in the background was offered at $35K and was a nice driver with original paint and interior in excellent condition. 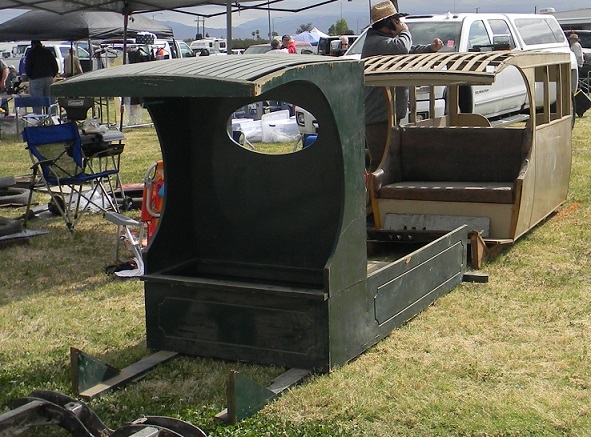 Locke bodied Lincoln phaeton was a nice project with excellent sheet metal. It was mostly complete, and not cheap. 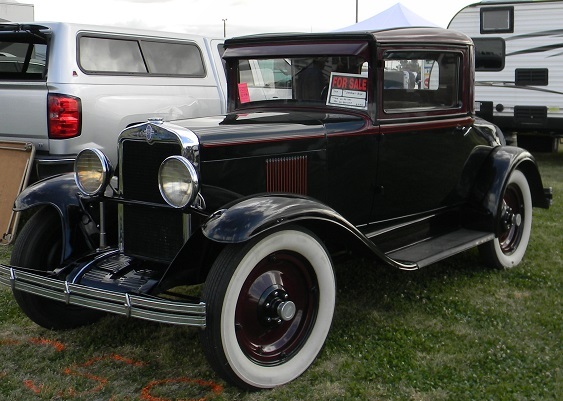 The ’28 Lincoln would make a fabulous restoration candidate. Need a body for that T chassis? 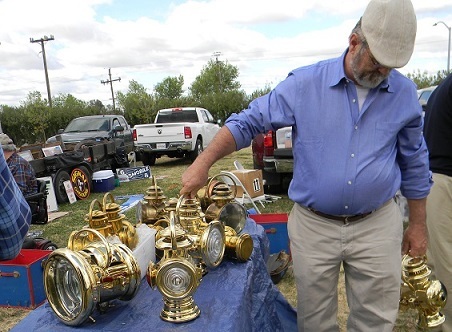 Many were at the swap meet for sale at reasonable prices. 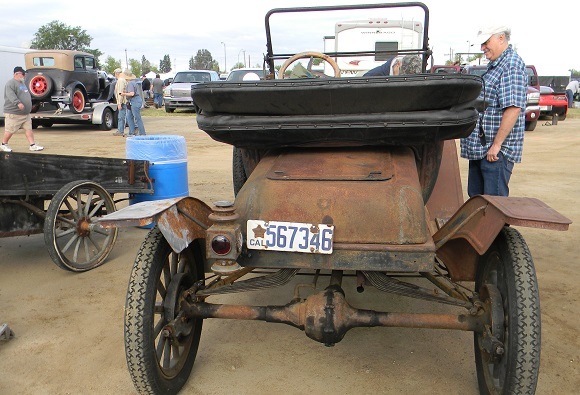 Lovely 1911 Overland did not appear to be for sale. I wouldn’t want to sell it if it were mine. 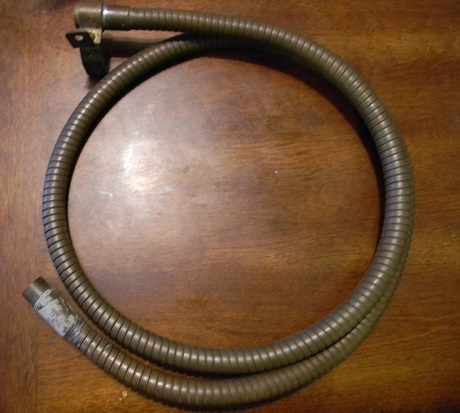 We spent about $125 at the swap meet and came home with a few treasures including this Winfield carburetor choke assembly. 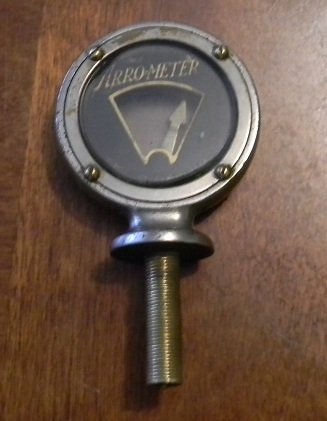 Arrometer was a competitor in the water temperature indicator business. They made very high quality meters that used an arrow to show temperature. 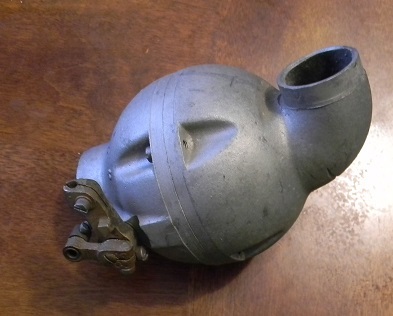 A new old stock 1915 Model T horn tube was a nice find. 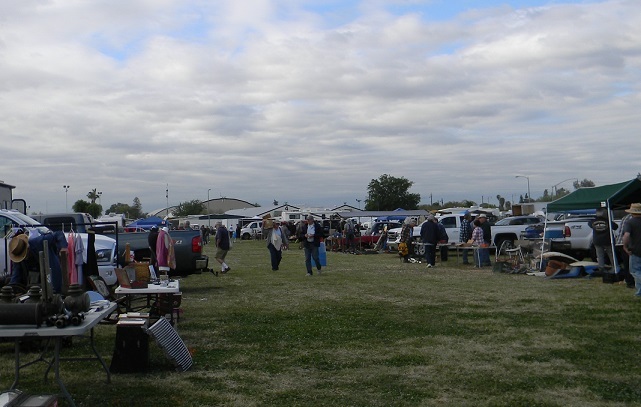 We had a great time at the Bakersfield swap meet. It’s worth a visit for those planning for next year. 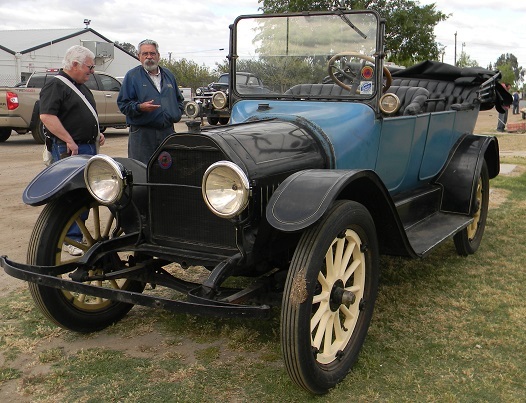 When we wrote about the Highland Park Plant in a previous issue of Model T Ford Fix we got the attention of Paul Rentz who has researched the subject to a greater extent than we have. 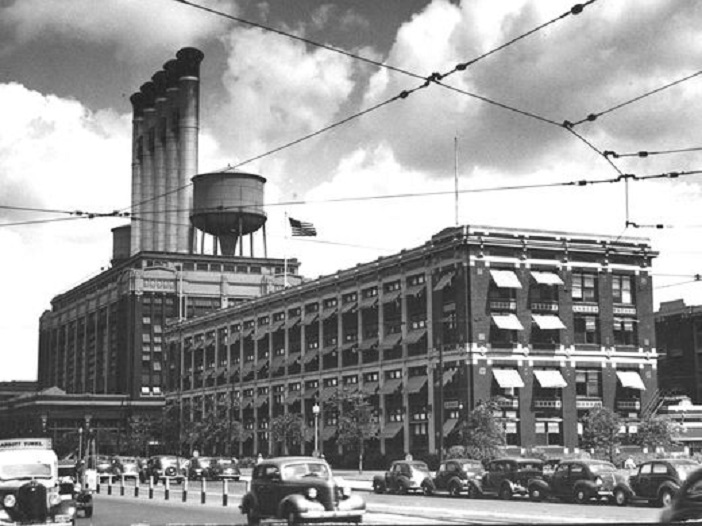 The building existed until after WWII, but the smoke stacks were silent from the day that power became available from the River Rouge plant’s generating station. WWII era photo showing the Executive Offices in the foreground and the silent smoke stacks of the Power Plant Building. The clouds in the sky make it appear that the smokestacks are operating, when in fact there are no engines in the plant to produce smoke! Below is Paul’s story of what actually happened to the huge DC generators inside, and why they went silent in the 1926 time frame. 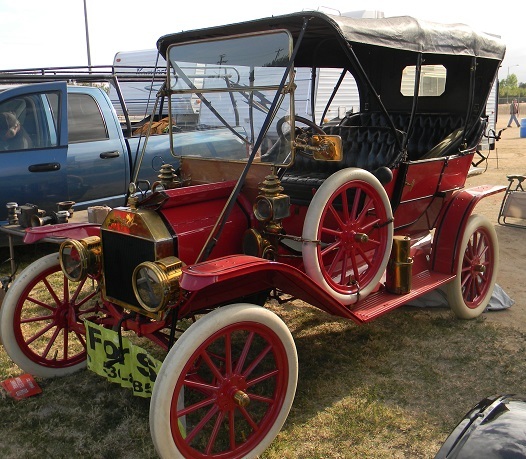 The Model T Ford upon its introduction in 1908 as a 1909 model was destined to be the world’s most popular and best selling car. It was replacing Ford’s Models N – R and S, already the world’s best selling and most popular cars. 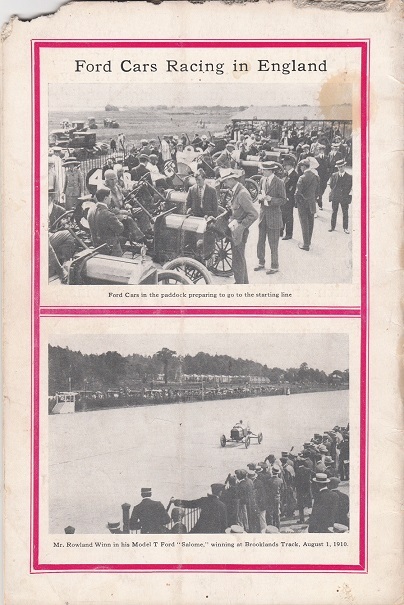 Back cover of a 1911 Ford Times sows racing events in England. Of course a Ford won! Ford advertising took many forms. There were advertisements placed in trade journals such as The Automobile, and advertisements in popular magazines such as Life and Harper’s Weekly. 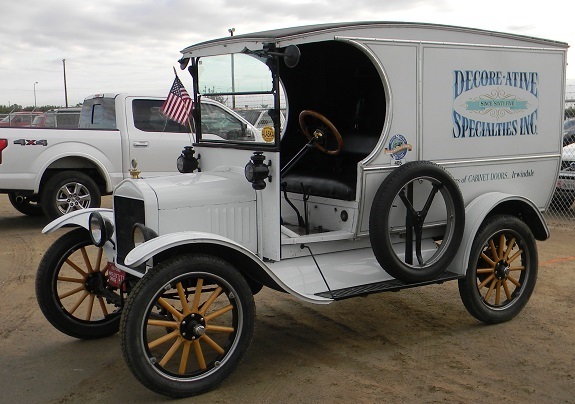 There were newspaper advertisements, post cards, and of course the in – house publication known as Ford Times. 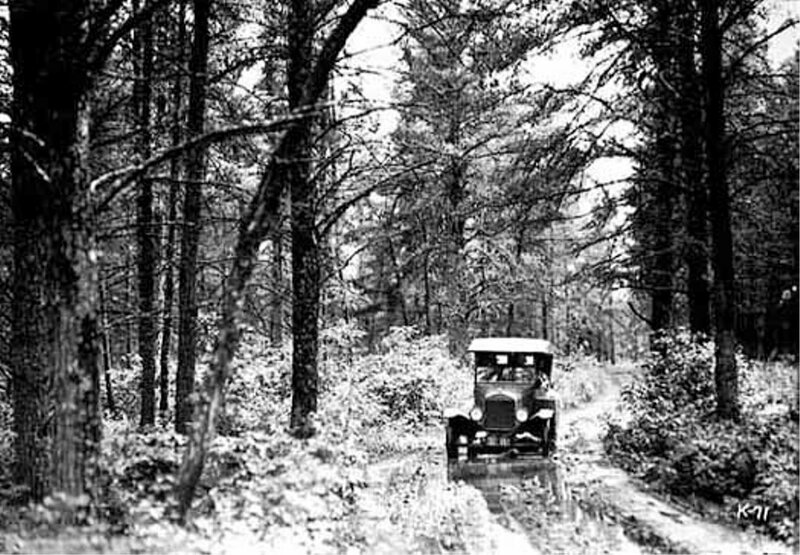 When the Model T was being sold and driven as a new car most Americans lived outside of cities on farms. There would seldom be any other car on the road. Meeting another car would be at a minimum an occasion to wave and honk. Perhaps you might even stop to exchange pleasantries, and to view the other driver’s machine. 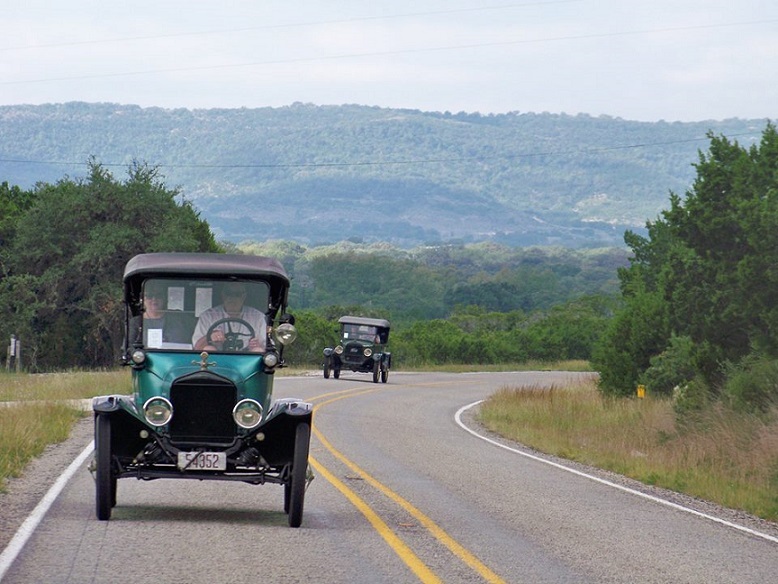 Today most of us are faced with the challenge of operating our Model T on the same road as other modern cars with their not – so – attentive drivers. 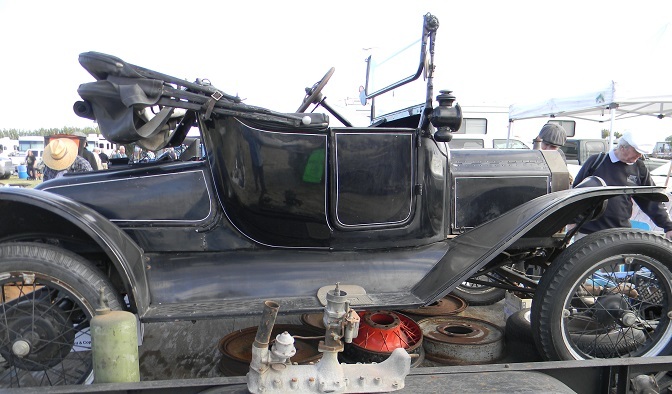 You and your Model T need to be on your game to stay safe out there. Hats off to Jim and Sandra Ruhman, the Space City T’s, the Neunhopfers, and the folks who helped them put on this wonderful, unforgettable tour. It was obvious from the first day how organized they were, how well planned the event was, how they had fun planning our fun week. Thanks to all! Today started a little earlier than normal due to the planned long day of touring. We departed the hotel about 8:30 headed down state highway 16 towards Medina, TX. It was lovely road, unbelievable scenery and lots of steep hills.